You may have heard a loud "whoop" from France in the past few weeks. No, it did not relate to the Coupe du Monde, nor to La Fête nationale (Bastille Day), but to a book. I received an email a month ago from my e-pal Philippe Bodard. We have never met, but have corresponded about whist books for several years. Philippe is the author of L'esprit du Whist and maintains the web site L'esprit du Bridge et du Whist. To appreciate the discovery, let me share some background. The earliest known translation of Hoyle was thought to be a Portuguese edition dated 1753, a book I wrote about here. A German translation of 1754 was thought to be second. The first translation into French was thought to be 1761. Well, you can see where this essay is heading. Philippe wrote to say that he had just acquired a 1751 French translation of Hoyle printed in Brussels, two years earlier than the Portuguese and ten years earlier than the first know translation into French! Thierry Depaulis (read about his work in the essay "Where can I learn more about Hoyle's writing? ), Philippe and I were involved in a flurry of emails and we managed to learn much about the book. They did most of the hard work--here I am recording their results. (1) Nowhere does the book mention Hoyle, although the title page notes that it is translated from English. 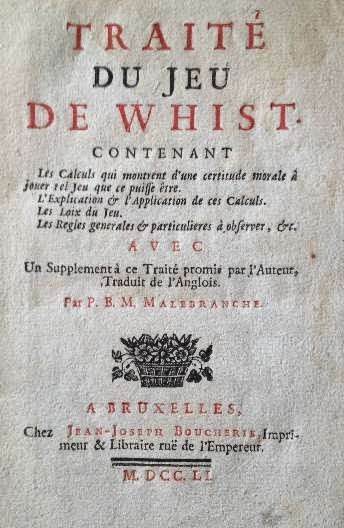 (2) The translation was commissioned by the generosity "d’un seigneur des plus distingués de ce pays," a most distinguished lord of Belgium, someone who will be difficult to identify. (3) The translator is P. B. M. Malebranche. Thierry has done a great deal of biographical research and identified the translator as Pierre Baltasar Maximilien Malebranche. He was born in 1695, traveled to England in the 1720s attending Oxford and Cambridge and settled in Brussels around 1730. He published a number of books and died in in Liège in 1789 at the age of 94. (4) The translation was made from the fourth London edition of Whist. There are a number of clues, but the easiest to note is the 24 laws of whist, as I describe in the essay "Changes in the Text of Whist." 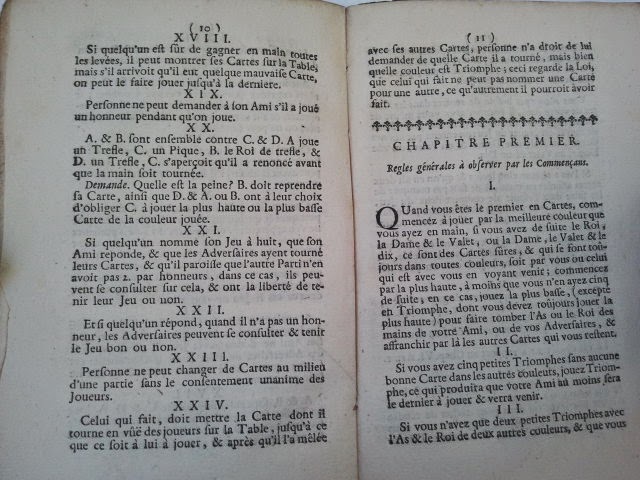 Interestingly, Malebranche did not use the more recent sixth edition of 1745, nor the "eighth" edition of 1748. (5) There is an error in the fourth edition. 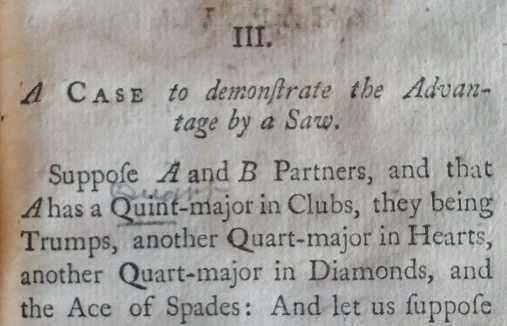 On page 51 the printed text in section reads “Suppose A and B Partners, and that A has a quint-major in clubs…” The 3rd and 5th editions both correctly say “quart-major.” The error is corrected in pencil in most copies of the 4th edition I have seen, likely by the bookseller. Malebranche gets this right, suggesting that he translated from a corrected copy. (6) Thierry has looked at all of the early French translations of Hoyle's Whist and concluded that there are five completely independent translations of the book (plus another two that are closely related to one of them). I find that curious. 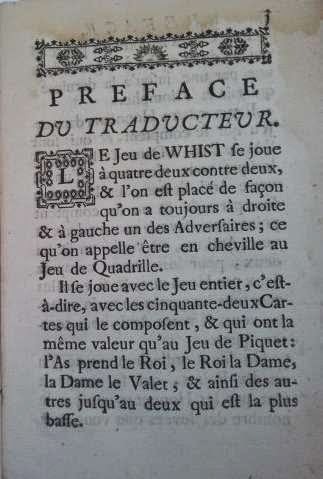 (7) The most fascinating item to me is the translator's preface, which gives rules for playing whist. In two essays on the nature of gaming literature (here and here), I distinguish rules from strategy. Rules are what allows you to play legally; strategy to play well. I noted that Hoyle never wrote about the rules of whist. Indeed the earliest one can find the rules of whist in English is the 1775 edition of Hoyle's Games Improved edited by James Beaufort. Malebranche's rules of whist are twenty four years earlier and appear to be the earliest rules ever published! Philippe has found a rare and interesting gem. I find it astonishing that it has not previously been noted in any library catalogue or in any research on gaming literature. Much thanks to Philippe for the photographs and to Philippe and Thierry for their research. From their many emails, I sense a note of pride that Hoyle's translation into French is now known to predate the Portuguese and German translations!